The Ryobi 18-Volt ONE+ Trim Router allows the user to create the perfect edge with the correct router bit and optional woodworking base. With 29,000 RPM, you can trim quickly and efficiently. The router features a compact design for fine routing. The Milwaukee M12 FUEL 5/8 inch SDS Plus Rotary Hammer Kit provides up to 2X more runtime, up to 75% more speed and the largest SDS Plus bit capacity in its class. Milwaukee has combined its exclusive POWERSTATE Brushless Motor, REDLITHIUM Battery Pack, and REDLINK PLUS Intelligence to deliver a 12V rotary hammer that rivals compact 18V tools on the market today. At only 10 inch long and 3.9 lbs, this tool provides performance and runtime that is comparable to a much larger tool, at a fraction of the size and weight. The electropneumatic design allows for drilling of up to 5/8 inch holes in concrete and masonry. For maximum versatility, regardless of application or orientation, the tool also features 2-mode operation, rotary hammer and hammer-only. The kit includes 2 M12 REDLITHIUM XC 4.0 Extended-Capacity Battery Packs, an M12 Lithium-ion Battery Charger, and plastic carrying case. The M18 Brushless Cordless Compact 1/4-inch Hex Impact Driver is the industry's fastest 18-Volt compact impact solution. REDLINK electronics and REDLITHIUM batteries deliver 3,200 RPMs for best in class application speed. Brushless motor technology provides 1,600 inch/lbs. of torque, more runtime and a more compact tool at 5.1, which means less trips to the charger and greater access in tight spaces. The first tool of its kind, the M18 FUEL SUPER HAWG delivers the power and run-time necessary to complete cordless rough-ins. Optimized for Plumbing and HVAC professionals, this drill powers through 6 inch holes and can drill over (75) 2-9/16 inch holes per charge in 2x dimensional lumber with a self-feed bit. The POWERSTATE brushless motor delivers constant power under heavy load to maintain drilling speed. REDLINK PLUS Intelligence is the most advanced electronic system on the market, preventing damage to the tool and battery caused by overloading or overheating. The REDLITHIUM XC5.0 batteries deliver up to 2.5X more run-time, 20% more power and 2X more life than standard 18 volt lithium-ion batteries. A mechanical clutch in low speed protects the tool from damage in the case that a bit binds up and the tool stalls. 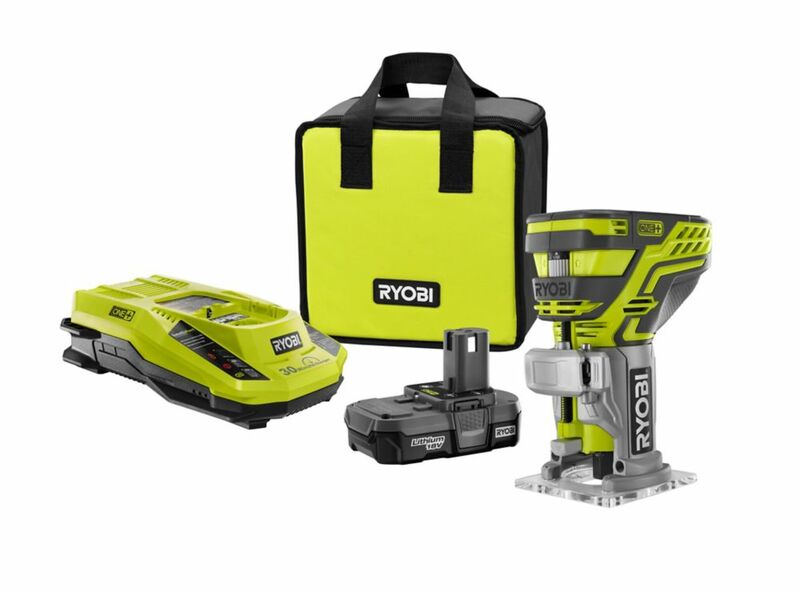 18V ONE+ Lithium-Ion Cordless Router Kit w/ 1.3Ah Compact Battery The Ryobi 18-Volt ONE+ Trim Router allows the user to create the perfect edge with the correct router bit and optional woodworking base. With 29,000 RPM, you can trim quickly and efficiently. The router features a compact design for fine routing. 18V ONE+ Lithium-Ion Cordless Router Kit w/ 1.3Ah Compact Battery is rated 4.0 out of 5 by 8. Rated 4 out of 5 by Tim from This router is very handy to use, no cords getting... This router is very handy to use, no cords getting in the way. Has decent amount of run time on 1.5 ah battery. I like it. Rated 5 out of 5 by Rutro from Have only had it a short time. Easy to use, love the portability. Have only had it a short time. Easy to use, love the portability. Rated 3 out of 5 by James from Battery life has been good since my purchase. Cutter speed is adequate. Router base could be wide... Battery life has been good since my purchase. Cutter speed is adequate. Router base could be wider for cutter path stability. Overall satisfied with product. Rated 4 out of 5 by Nobody from Works well Used on a fairly large project. The battery overheats easily but waiting for the battery to cool allowed the router to turn on again.